Good quality organic cider vinegar is a positive addition to the kitchen pharmacy. Organic unpasteurised cider vinegar is made from apples and contains cloudy sediment which is the live culture and known as the “Mother”. In most commercially produced vinegars the “Mother” sediment is seen as off putting and is filtered out. The live culture combined with the acetic acid provides the many benefits of apple cider vinegar including antibacterial and anti-fungal properties. 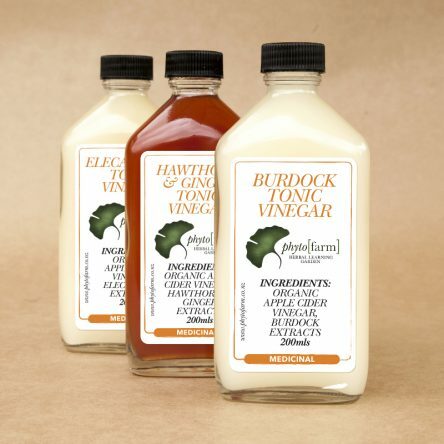 Pre-biotic Gut Repair Tonic Vinegar: Elecampane or Burdock. These herbs are high in inulin, which is extracted in apple cider vinegar and encourages the growth of healthy bowel flora. Warming Circulatory TonicVinegar: Hawthorns Berries and Ginger.